Manhattan Construction Company begins construction on Patterson Mansion in Washington, DC. 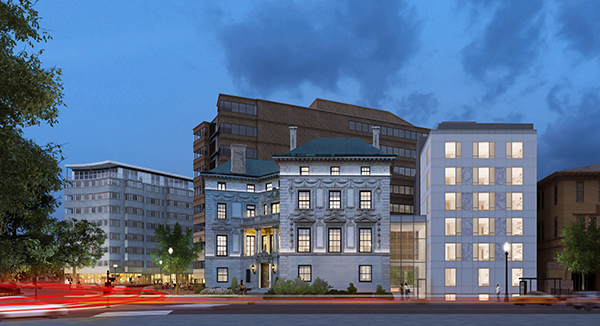 Washington, D.C. – Manhattan Construction Co. has begun renovation work and new construction on the 67,000-square-foot Patterson Mansion project located in Washington D.C.’s Dupont Circle. Manhattan Construction is providing pre-construction and construction management services for the building owners and joint developers, DC-based SB-Urban, LLC and Rooney Properties, LLC. Demolition work, which was recently completed, began in August 2015. Hartman-Cox Architects is the architect. The Patterson Mansion, a historic Neoclassical-style mansion, will be converted into 93 fully-furnished, luxury studios. The 25,000-square-foot existing five-story mansion structure and the new 42,000-square-foot, eight-story addition will include a workout facility, library, dining room with large shared kitchen, bar and party area, and an outdoor terrace for resident interaction. The 112-year-old Patterson Mansion was previously owned by The Washington Club, one of the District’s oldest women’s social clubs since 1951. The house was originally designed for entertaining. President Calvin Coolidge and his wife lived there in 1927 while the White House was being renovated, and Charles Lindbergh was a visitor in June of that year. The house remained in the Patterson family until 1948, when long-time resident Eleanor (Cissy) Patterson died and left the property to the American Red Cross. The Red Cross sold the house to the Washington Club three years later. The Patterson House was listed in the DC Inventory of Historic Sites in 1964 and the National Register of Historic Places in 1972. Founded in 1896, Manhattan Construction is consistently recognized nationally by Engineering News-Record as a top 20 general builder. Manhattan Construction operates from offices in Tulsa and Oklahoma City, Okla.; Dallas and Houston, Texas; Naples, Fort Myers, Sarasota, Kissimmee, Fla.; Washington, D.C.; and Atlanta, Ga. Manhattan Construction’s building portfolio includes corporate headquarters, institutional, healthcare, office, hospitality and leisure, sports and entertainment, aviation, retail, and judicial facilities throughout the United States, Mexico, Central America and the Caribbean. For more information visit: www.manhattanconstruction.com. www.manhattanconstruction.com. A beacon of progress and development for the next century. The Oklahoma Capitol building was designed and constructed a century ago. Our Manhattan Construction and Frankfurt-Short-Bruza team has been working on a collaborative effort with the State of Oklahoma to develop the Capitol’s first-ever master plan and long-range vision. The proposal addresses the State Capitol Repairs Expenditure Oversight Committee’s (SCREOC’s) goals and criteria, and provides solutions to the requirements requested by the Office of Management & Enterprise Services (OMES). The proposal addresses the highest priorities of repairing vital infrastructure and utilities, and establishes a master plan and long-range vision for continued improvements to what Dr. Bob Blackburn, deputy executive director of the Oklahoma Historical Society, refers to as “Artifact Number One.” Our team is excited to share the proposed vision in this video animation, which was presented to the Oklahoma legislature today. You are currently browsing the Manhattan Construction Group blog archives for December, 2015.